Thanksgiving is next week- can you believe it?! That means a lot of you might be decorating your trees here in the next week, so I wanted to offer up some tips on how to make your tree look full and beautiful on a budget. I’m also spilling the beans on this gorgeous $79 flocked tree that we got since I’ve had so many questions about it! Jett is just over 5 months old and so far I’ve lost about 45 of the 55+ pounds that I gained during my pregnancy. It’s definitely taking a lot longer to lose the weight than I had anticipated or hoped, but honestly I’ve finally come to terms with the fact that it’s going to take as long to come off as it did to put the weight on. 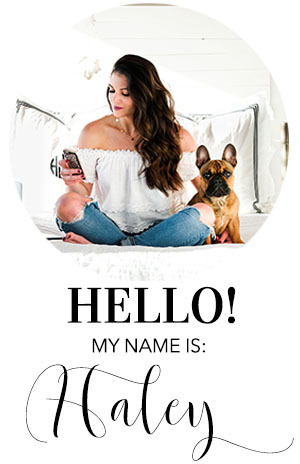 Today I wanted to share with you what has worked for me to get the baby weight off as well as my favorite place to shop for cute workout clothes! Keep reading for all of the details!